CHICAGO (FinalCall.com) - After nine months of silence regarding the historic presidential campaign of Sen. Barack Obama, the Honorable Minister Louis Farrakhan spoke the words that many have been waiting to hear him say. "Congratulations are absolutely in order for President-elect Barack Obama," said Min. 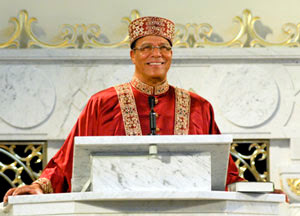 Farrakhan as the crowd erupted in cheers and applause during his opening remarks on Nov. 9 at Mosque Maryam, the international headquarters of the Nation of Islam. Addressing a national and international media contingent and thousands viewing live via webcast, Min. Farrakhan answered many questions and ended a great deal of speculation surrounding his views on President-elect Barack Obama's political ascendancy and the future of America. "What happened (on Nov. 4) has energized the entire world of man and mankind in a way that has never been seen before in the history of political elections in the United States of America or anywhere else in those nations that are committed to the principles of democracy."